Rastos Deluz Bathroom Blog: Bathrooms – how much could you spend? You could get a new bathroom suite for just a few hundred pounds, but bathrooms can and do cost a lot more. 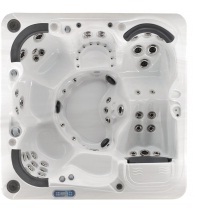 More and more people are purchasing extravagant and luxury bathroom items like hot tubs for sale that can be used indoors or out. The amount you want to spend on re-doing your bathroom or bathrooms is up to you. If you want something particularly complicated, or you just want the very best suite and furniture available, your bathrooms can cost a lot of money, so let’s look at where those pounds go. Showers – most people who are fitting showers in bathrooms today want a powerful shower and as much room as possible. The bigger the shower enclosure, the more luxurious it feels. You can buy your shower tray and enclosure separately, or you can go for a shower package – which may also include the shower itself and the controls. You should check this out though, because many packages will have shower controls as extra features, so that you can choose a style that will match your taps and other fittings. A large shower enclosure could cost as much as £3,000. Baths – free-standing roll-top baths are the most popular baths for those who have big enough bathrooms. They give an immediate feeling of space and luxury and you can get a wide range of taps, from ceiling taps to wall-fitted taps to help make your bath the focus of the bathroom. Free-standing baths are often cast-iron and come with ornate legs, or resting on wooden plinths. Many come with unpainted exteriors so that you can paint the outside of your bath to match your colour scheme. Prices can go as high as over £3,000 for baths with polished exteriors or of a particular design. Basins – basins are less expensive because they are smaller, but if you are designing a “his and hers” area, you’ll need to double up on basins and stands or shelves if you’re going for a contemporary look. Expect to pay around £300 for basins by well-known designers such as Philippe Starck. Toilets – again, toilets are in the region of hundreds of pounds rather than thousands, and if you’re getting a toilet to match your basin, you can expect to pay a little more for it. Toilets where workings have to be boxed in, such as wall-hung toilets may cost you a little extra in labour than traditional styles. Taps and fittings – taps and shower fittings often give your bathroom a really stylish look, so you need to choose carefully. You can pay out for antique taps if you’re planning a period bathroom, or you can go for ultra-modern designs. Mixer taps are particularly popular, with wall-mounted spouts and level-operated taps. Expect to pay around £200 for the best, and remember that you’ll need to buy taps for your basin, your bath and controls for your shower. Of course, you can refit your bathrooms for well under £1,000 if you shop smartly and take advantage of online discounts, but for those with a lot of spare cash, expensive bathrooms aren’t hard to find.